Controversy is brewing at another property owned by a notorious Metro Vancouver landlord. A low-income advocacy group is calling for more protection of tenants, in light of what’s happening at a Surrey complex. 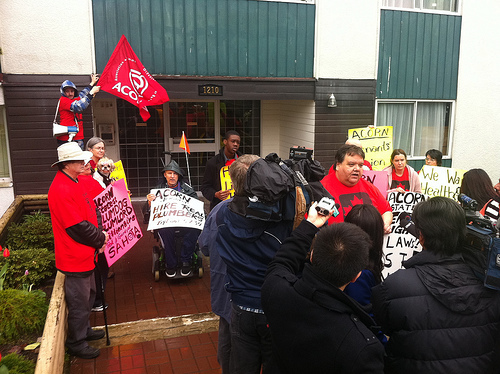 ACORN Canada is objecting to eviction notices the group says have been served to everyone at Kwantlen Park Manor, a 31-unit apartment at 106th Avenue near 130th Street in North Surrey. It’s a building linked to the Sahota family, which is behind a number of other buildings that have had problems. Mark your calendars! 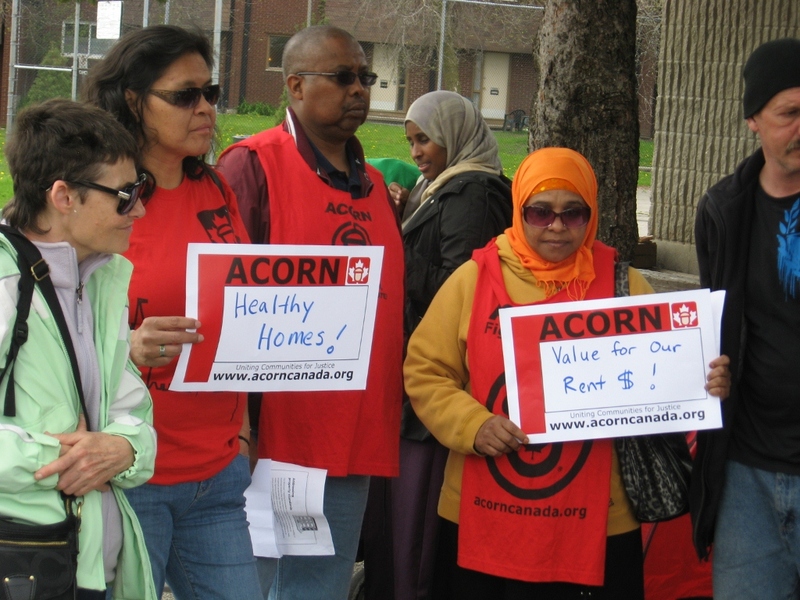 Ottawa ACORN Healthy Homes Forum - Tuesday, March 5, 6pm at 2525 Alta Vista (St. Patrick's High School, in the cafeteria). Hear about changes we've won from the city, participate in a public discussion on Healthy Homes for Ottawa and meet city by-law and councillors engaged in the campaign. 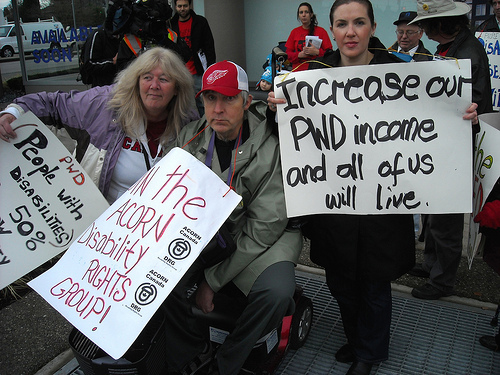 After 3 months of actions at Ministry of Social Development offices demanding a meeting with Minister Moria Stillwell, leaders from BC's ACORN Disability Rights Group sat down with her in January to discuss their rights based campaign demands around Persons with Disabilities (PWD) allowances. This is an exciting time for Nova Scotia ACORN as we continue to strengthen our membership base and raise our profile in our shared communities. Our work by, and for, those impacted by poor income assistance policies and the deplorable conditions of rental housing continues to be a central focal point of our work. The calls of our membership for safe, affordable, and sustainable policies within a human rights framework have been noted in local media and at educational events, but there is much work to be done. If one is not poor themselves, it is easy to look at a neighbourhood like Highfield Park or the north end of Halifax as nothing more than inspiration to donate to a food bank. It has been apparent for years that the Residential Tenancy Act leaves renters in BC with an impotent dispute resolution process which offers scant protection from predatory landlords. The stories of abused tenants are legion; however the Liberal government continues to callously ignore their plight at every turn. The first ever $115,000 administrative penalty against the infamous slumlord family, the Sahotas, has been negotiated away while repairs to the Surrey building connected to that penalty remains unrepaired. Worse still the tenant who fought for repairs, Sue Collard, has been forced out of the building! Tenant harassment continues unabated in British Columbia, as do rent-evictions and reno-evictions. The scourge of black mold ravages the health of tenants both young and old, and simple repairs remain as difficult to get done as ever. 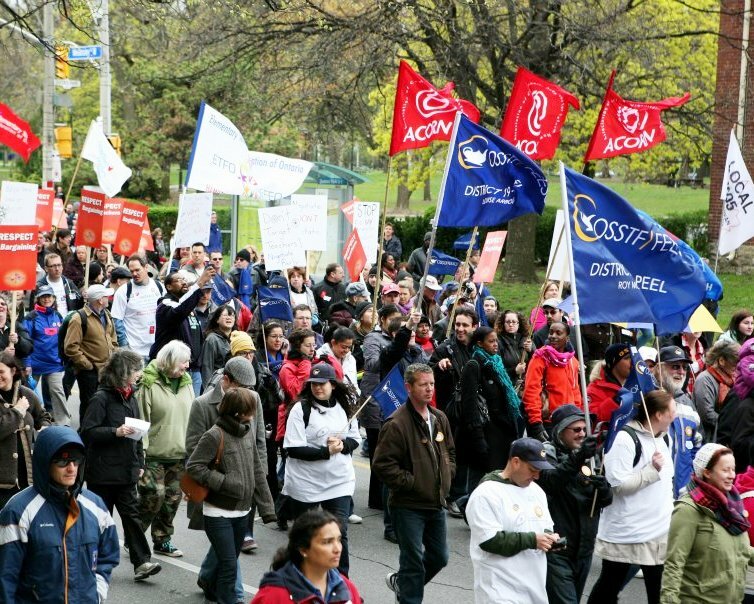 Toronto ACORN members joined with over 15,000 activists, labour organizations and community groups from across the province on the lawn of Queen's Park earlier this month to rally against austerity measures in the Liberals’ provincial budget. The crowd heard moving and powerful speeches from representatives of nearly 20 organizations before moving forward in an impressive march through the city. The event helped put pressure on the government to vote for a budget that adds a surtax on the super rich, and rejects a social assistance rate freeze. ACORN Canada's office in New Westminster has become a hub of action for the 6th year in a row as we kick off our full time Free Income Tax Preparation Clinic. It's a packed house on a daily basis, which has helped us to complete over 500 returns in February alone! In partnership with Van City Credit Union, ACORN Canada has volunteers waiting to do simple tax returns and help people save and redeem their hard earned money and credits. Since 2007 ACORN Canada has filed over 6000 returns for people in New Westminster, Surrey, Burnaby and beyond out of our office in New Westminster. That’s over $7 Million in tax returns, credits and benefits going back to communities where our members live, and over half a million dollars in direct tax prep cost savings, avoiding the high interest costs associated with corporate tax preparers. 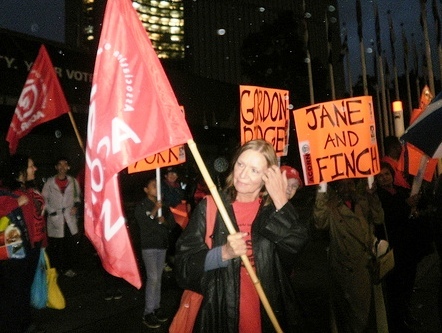 On January 17th, Toronto ACORN members from across the city will be rallying at city hall while city council meets to discuss and vote on Mayor Ford's proposed 2012 budget. Despite the city's close to $150 million surplus, the Ford administration is pushing massive unnecessary service cuts as part of a radical conservative agenda. Toronto ACORN members will be gathering at 4pm at the front doors of City Hall and progressing into council chambers with the demand that council votes against the proposed cuts to childcare, transit service, community centres, libraries and other services that are essential parts of our neighbourhoods. Bay Ward Coun. Mark Taylor vowed to clean up Michele Park and make the area safer after a small group of angry residents held a protest there on Tuesday. Residents said there isn’t enough lighting on streets at night and are worried about gang violence and garbage in and around the playground. 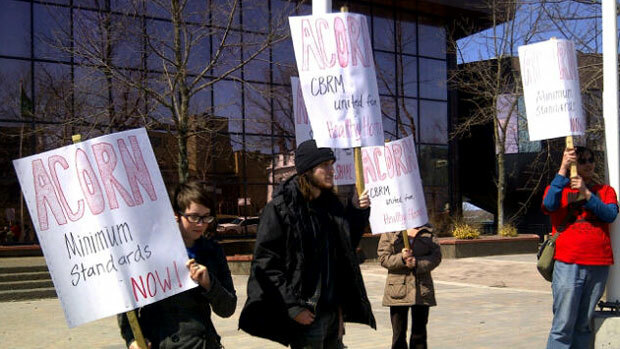 ACORN Ottawa, a non-profit organization that advocates for low-income families, organized the protest. “As you can see, the garbage laying around —that’s a big issue,” said Jessica May, a mother of two who lives near the park. 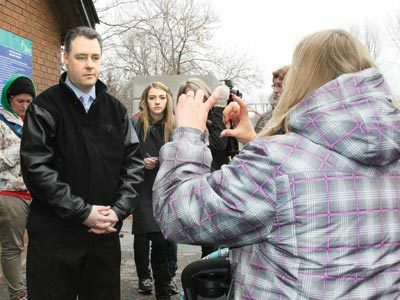 Taylor reassured residents that he will address issues such as lighting, garbage and recycling receptacles, and maintenance of the park. But he also requested that the community take an active role in improving the conditions of the park. Taylor encouraged the community co-ordinator for the area to attend his upcoming bi-monthly meeting in January to address residents’ biggest concerns.